It was a quiet start…a tiny operation called Meco & Elia that Maria Elia ran with her partner. Meco handled front of the house (mainly opening the door) while Maria created the menus, took the orders, cooked the food, and presented the bill (cash only). Not bad when you consider that Maria was six, Meco was Mitzi her half Jack Russell/half Poodle dog and the customers were Maria’s parents. And not surprising that Maria knew she wanted to cook from an early age. She grew up in the restaurant business (her Greek father ran his own restaurant in London) and remembers being four years old and standing on a stool so she could toss potatoes into the rumbler (“It wasn’t exactly health and safety,” she says with a laugh.). 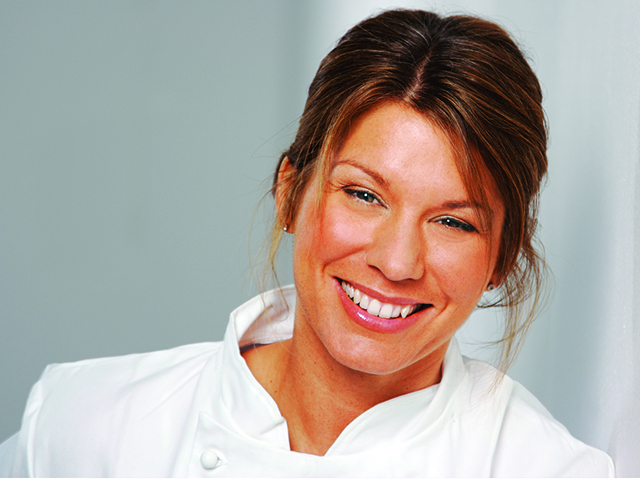 Today, Maria is one of the most exciting chefs and food writers on the scene. She lives in London but has cooked around the world and published two great books (a third is due out in the Fall). What makes her food so exciting is that she takes interesting ingredients and gives them a completely fresh and unexpected twist. 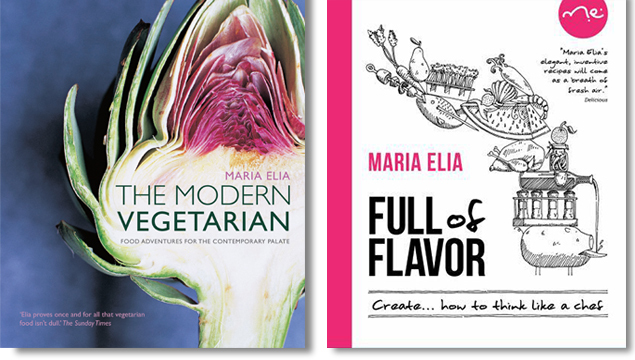 I loved her first book – The Modern Vegetarian – because unlike some veggie books you genuinely don’t miss the meat. The vegetable is the hero and the recipes are amazing. Take miso – a Japanese staple – which goes Greek in her Miso-marinated kataifi-wrapped eggplant. Or how she pairs sweet strawberries with bitter radicchio for her Griddled Radicchio and Strawberry Risotto. The combinations are unusual but they’re not way out – they work. Maria likes to start with an ingredient – maybe one that evokes a strong memory for her – and then take it on a flavor journey to see where it can go. She often creates a mind map on paper to explore the different connections that a single food can make. In her second book, Full of Flavor: How to Create Like a Chef, she takes 18 different ingredients and spins out lots of different flavor combinations for each one. The results are dazzling. 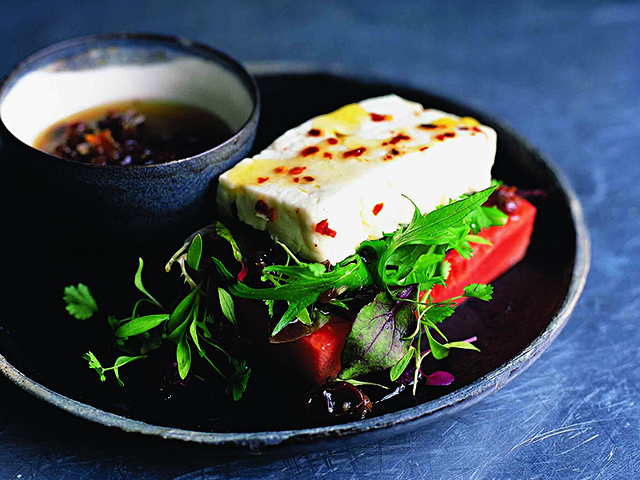 The contrasts in this recipe are wonderful; I love the warmth of the feta and the heat from the chile against the cold sweet watermelon. The dressing is great with white beans, crumbled feta and some lettuce leaves. Or, if you prefer to keep it simple, just use a little lemon-infused olive oil to dress the watermelon. Perfect as an appetizer or light lunch. Remove from the oven and assemble immediately; snip the cilantro and shiso sprouts (if using) and mix with the baby leaves and pine nuts (if using). Dress with a little of the Raisin and Oregano Dressing and pile neatly on top of the chilled watermelon slabs. Open the parcel and place the roasted feta on top of the salad leaves. Drizzle with the olive oil and serve immediately. Store in the refrigerator until required.